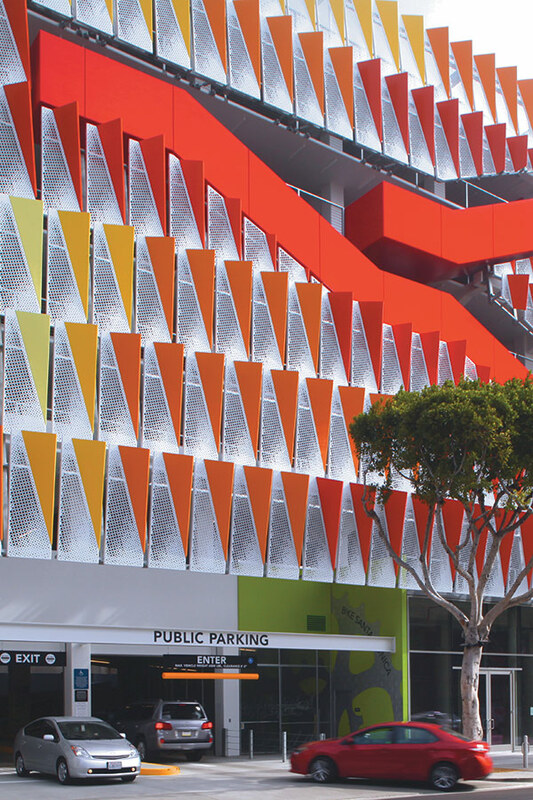 The 744-space parking structure features a dynamic facade of multi-colored aluminum sails. A red stair, reminiscent of the Centre Pompidou, zigzags across and through it. “The stair automatically gives us a sense of where we are, where we’re going,” said Jantzen, who noted that it has also become a destination for joggers. In addition to parking for cars, the garage includes indoor bicycle parking, 7,000 square feet of retail space, 3,000 square feet of farmer’s market storage, and 800 square feet of space for downtown Santa Monica. Thirty electric vehicle charging stations are already in place, plus infrastructure for dozens more. 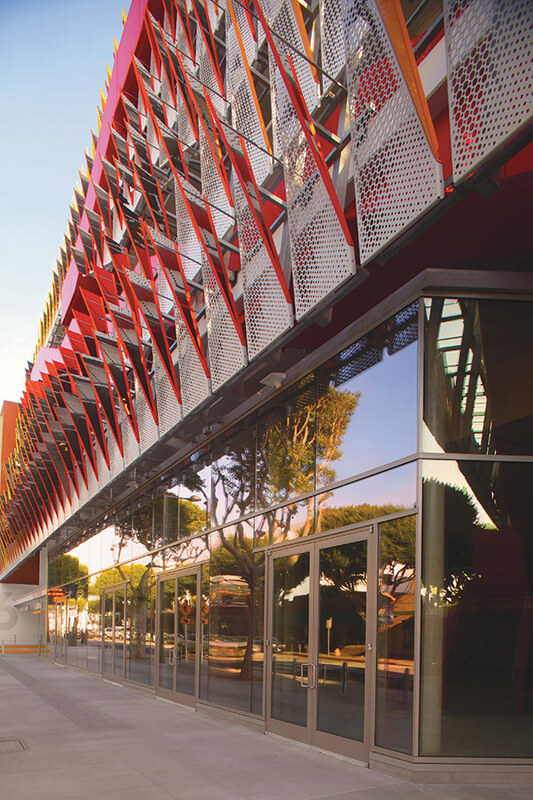 The garage’s facade was the product of a sustained collaboration among Behnisch Architekten/Studio Jantzen, International Parking Design, contractor Morley Builders, and several consultants, including an aerospace engineer who helped assess the impact of wind resistance on the sails. The perforated sails, which are folded at different angles to direct light into the structure, were fabricated of an atypical aluminum alloy that resists corrosion. Installation was initially a challenge, said project manager Krystal Chang, but by the end of construction crews were installing approximately 20 panels per day. Santa Monica Parking Structure #6 has “an enlightened approach to the pedestrian,” said city architect Miriam Mulder, observing that this is “ironic in this edifice to cars.” Besides making room for a large plaza out front, the garage is accessible to pedestrians from both the street and alley sides. A protected passageway invites walkers to cut through the space, and separate signage clearly marks pedestrian exits. 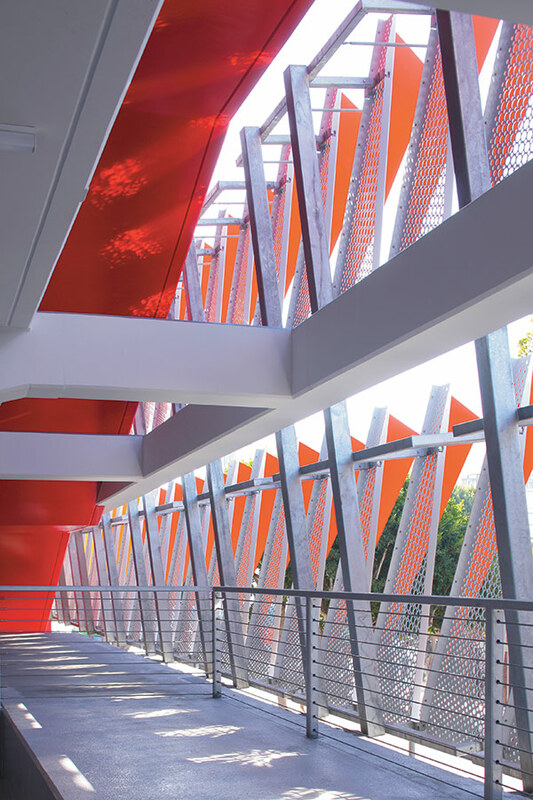 A red-painted walkway, which Jantzen calls a “red carpet,” directs users from the parking bays at the back of the structure to the feature stair at the front. The garage was built as part of a citywide push to increase parking through the construction of architect-designed structures. 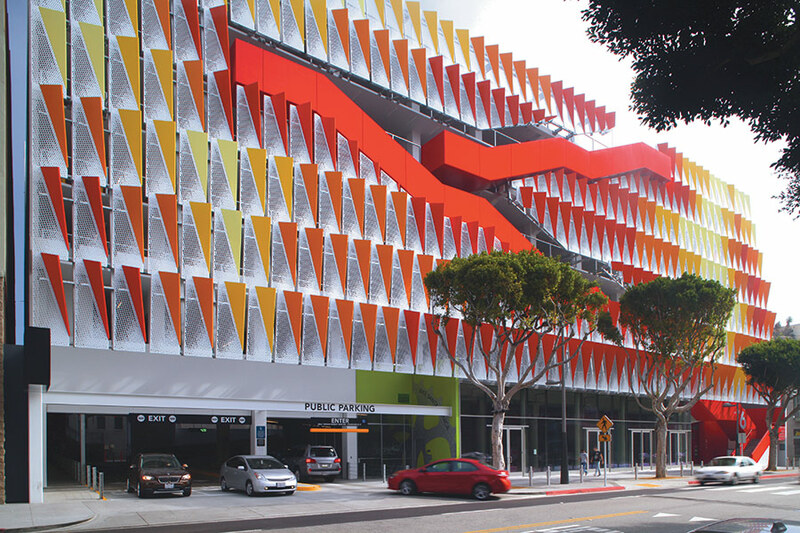 Other projects include several garage renovations by Brooks+Scarpa Architects, and Moore Ruble Yudell Architects & Planners’ Santa Monica Civic Center lot, the first LEED-certified parking garage in the nation. The city hopes the new structures, in addition to making things easier for drivers, will contribute to the revitalization of downtown Santa Monica. “The parking structure itself doesn’t solve all the city’s problems,” said Mulder. But as a new kind of public space, it’s a good place to start.